Hello and welcome to Reader Girls. 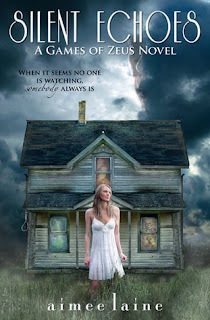 We host the Silent Echoes Blog Tour presented by J. Taylor Publishing today. This tour is different from other tours we've hosted. 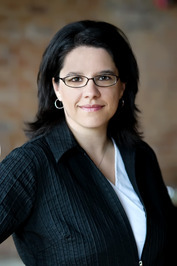 Author Aimee Laine is playing actual games at each tour stop. Game playing is a prevalent theme in Silent Echoes. We'll let the author explain. Our review will up later today. Silent Echoes is a "Games of Zeus" novel but it's not a traditional mythological conundrum. No, as the author, I’ve taken quite the liberties in creating a situation Zeus could have used to mess with we puny humans. So, to have a little fun as Silent Echoes releases this month, my host here at Reader Girls Blog has challenged me to create a Game of Zeus out of Backgammon! How could Zeus use Backgammon upon two unsuspecting humans? How could he manipulate a seemingly innocuous game into a maniacal, devious relationship conflict? Oh, let me count the ways ... or rather, let me show you. let me tell you a little about Silent Echoes. The objective of this game is to clear the board. The first player who’s done that wins. For a couple in love, what will they have to clear? What hurdles will they have to eliminate? What obstacles might be there that they have to move left and right, forward and backward to get to the goal? In reality, aren’t there always obstacles to a relationship? In Backgammon, the players have the same type of game piece, right? A checkers-like piece in fact. The pieces almost dance around each other, one player vying to get by the other until they can remove their piece from the board. And repeat. And repeat. Until all are gone. In a relationship, what if he (and she!) has had a string of relationships and every time these two get together, another member of ‘relationships past’ appears to break into/interrupt or force the new relationship to work through issues from the past. It’s not unheard of, is it? In fact, this may not even need to be Zeus inspired. So what would Zeus do? Oh he’d make sure, there’s no way to get around these old relationships. That every time these two people get together, bad past experiences will pop up. Every time. Every every every time. You see? Zeus takes the simple and multiplies it until it seems like there’s no way to get around it. Now you might say, ‘surely these people won’t have THAT many past relationships.’ Maybe not. But in a Zeus story ... they would and/or every past person (romantic or not) will be an interruption. Every last one of them. And you know, from the moment of birth, that you’ve interacted with thousands of people. How long do you think it’ll take to get through all of those to finally marry The One? And there you have it. What do you think? 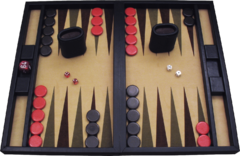 Is Backgammon a possible Game of Zeus? Aimee is a romantic at heart and a southern transplant with a bit of the accent (but not a whole bunch). She's married to her high school sweetheart, and with him, she's produced three native North Carolinians, two of whom share the same DNA. With an MBA and a degree in Applied Mathematics, there's absolutely no reason she should be writing romance novels. Then again, she shouldn't need a calculator to add two numbers, either ... but she does.